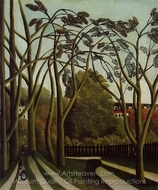 Henri Rousseau was a 19th century artist known for his realistic and inspiring depictions of scenes in nature. 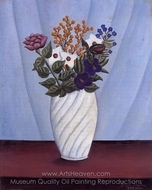 Though the techniques used in Henri Rousseau paintings were deemed immature by some critics, others noticed a complexity and sophistication that set Rousseau apart from other artists of the time. 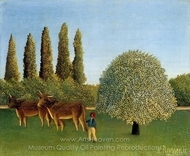 Rousseau is also known for his invention of a new painting style: the portrait landscape, which involves painting a landscape with a subject in the foreground. 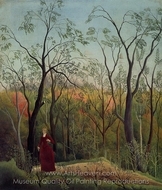 Rousseau was born in 1844 in the Loire Valley of Laval, France. His father was a tinsmith, and he worked in tin during his childhood. When he reached high school age, he attended the school in Laval. At first, he attended the school only during the day. However, after his parents' home was seized for unpaid debts, he became a boarder. Though he excelled in music and drawing, his performance in most other subjects was average at best. After high school, Rousseau studied the law and spent time working with an area lawyer. After deciding not to pursue a career in law, he joined the army. He served from 1863 to 1867, and his father died soon after. 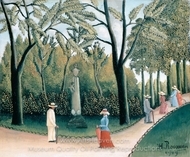 After his father died in 1868, Rousseau began work for the government in Paris to take care of his mother. During the same year, he married his landlord's young daughter. Together, they had six children, only one of whom survived. 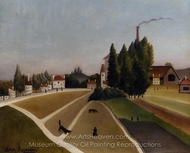 In 1871, Rousseau began working as a tax collector. His first wife died in 1888, and he married his second wife ten years later. It wasn't until he reached his forties that he began painting seriously, and he was working on his artwork full-time by the time he reached 49 years of age. He worked on his art in Montparnasse until he died in 1910. According to Rousseau, nature was his only teacher. Many critics consider his work to be uneducated and primitive. 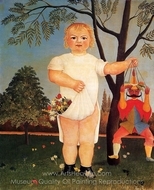 Nonetheless, Henri Rousseau paintings are still revered and admired today. 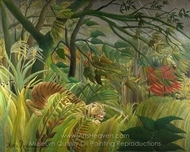 Most of his most popular paintings are of jungle scenes. 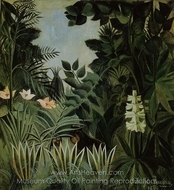 However, Rousseau never actually saw a jungle himself. Instead, he gleaned his knowledge of the environment from the botanical gardens in Paris, a collection of taxidermied animals and illustrated books about the jungle. He also listed to the stories of soldiers he met during his time in the army who had survived France's expedition to Mexico. 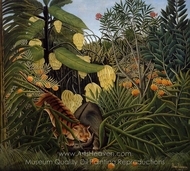 In addition to his jungle scenes, Rousseau also painted some topographical images of the city. 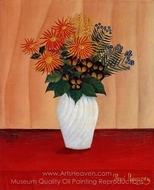 Beginning in 1886, Henri Rousseau paintings were on display in the Salon des Independants. Henri Rousseau paintings weren't placed conspicuously in the Salon, but he still built a solid following during subsequent years. In 1891, he created and displayed a particularly famous painting, titled Tiger in a Tropical Storm, Surprised!. In 1897, he produced another of his most well-known works, The Sleeping Gypsy. In 1905, another of his great works, "The Hungry Lion Throws Itself on the Antelope," was exhibited alongside the works of leading avant-garde painters. 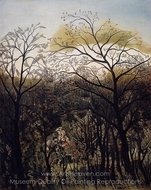 Finally, in 1910, Rousseau exhibited his last painting, entitled The Dream, which joined the ranks of the other famous Henri Rousseau paintings. 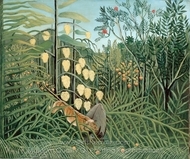 This final painting was displayed for the public only two months before Rousseau's death.